The biggest problem in 2016 was that the Republicans allowed a crazy person to take over their Party and flout every rule and convention of U.S. politics, and quite a few federal statutes as well, which they don’t care about as long as they win. But the national press deserves a healthy share of the blame. Lots of people have noticed the problem with reporters and false equivalences. In important respects, the two major Parties have very similar flaws, especially in terms of relying too much on large donations from corporations and shady characters, although the Republicans are clearly worse about this than the Democrats. It is simply not the case, however, that any supposed leftward movement (back to the, um, New Deal? Great Society?) is equivalent to the bizarre movement to the right of the Republican Party, which is not conservative at all because it has zero historical antecedent in our history. The last responsible Republican President was Dwight Eisenhower. Since then, Republican presidents have been a rogue’s gallery of men who have varied only in the amount of scandal they have brought to the office, with the least scandalous — the elder George Bush and Gerald Ford — also being entirely forgettable as presidents. It simply is the case that one Party, the Democrats, since the New Deal, have much more consistently pursued policies that actually benefit the nation than the other Party, the Republicans. Trump is just the logical culmination of Republican corruption and perfidy since Nixon. Reporters should say so. Obama implicitly blames the Republicans in the clip above, and well he should, but what he does not say is that the Republicans’ fear mongering only works because the national press plays into it and amplifies it. One study found that the New York Times, which is not failing as Trump says it is, but is failing in its role as the national newspaper of record with its piss poor coverage of important events, ran as many stories about Hillary Clinton’s emails as it did all policy issues in the 69 days before the election. On Tuesday, July 5, 2016, James Comey announced that he would recommend no prosecution of Hillary Clinton or anyone who worked for her because of their “extremely careless” mishandling of emails that were classified to varying degrees. He did then announce that the FBI had discovered more potentially relevant emails and was reopening its investigation into the matter less than two weeks before the election, which many observers think helped Trump win. We will never know, but the second announcement only seemed hugely important because the public had been primed by ridiculously excessive coverage of the topic by the national press. Context is everything. Hillary’s emails did not deserve anywhere near as much coverage as they got. The proof is in the pudding. Had hostile foreign actors used her emails to harm U.S. interests, we would have seen the effects. Stop and think about what matters and what does not. You people are supposed to be smart. It seems obvious that a lot of people listen to you, perhaps more than they should. Balance is important in all things, and “balance” here does not mean treating two very unlike things in like manner just because of their superficial similarities. Thomas Mann and Norman Ornstein, both highly reputable political scientists, explained as far back as 2012, that the Republicans are responsible for the parlous state of our politics, and this is obvious from numerous events, starting, if not with Nixon, then at least with New Gingrich’s pursuit of House Speaker Jim Wright into retirement in 1989. This juxtaposition alone should give everyone pause, but apparently it hasn’t. Wright may or may not have violated House ethics rules with his book deal, but Gingrich has since racked up a history of ethically objectionable conduct that few U.S. political leader can match. The two are not remotely equivalent, yet the press still treats the Parties they represent, especially the Republican Party, which has benefited from Gingrich style bomb throwing and hyper partisanship ever since, as equivalent. The press should be dispassionate. They should report the warts on the faces of Democrats just as they report the warts on the faces of Republicans. 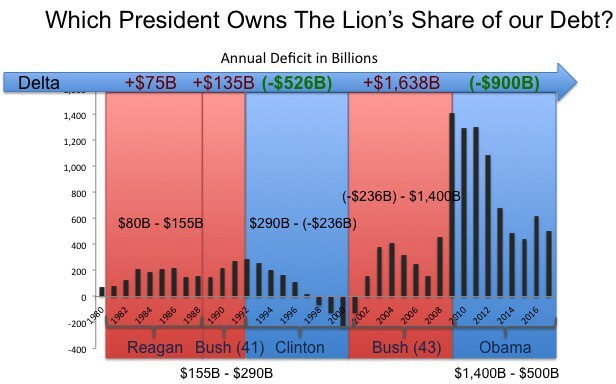 But they help the Republicans perpetuate the absurd myth that they are the Party of fiscal responsibility when they have accumulated the vast majority of the enormous national debt we now own, beginning with Ronald Reagan. Only one President since World War II has produced balanced budgets, Bill Clinton. Obama, despite coming into office during what we incessantly heard was the worst recession since the Great Depression, still managed to reduce annual federal deficits significantly. Most people still seem to struggle with the distinction between annual deficits and the total national debt. Reporters have the responsibility to help explain these basic features of our public life. The press lined up behind George W. Bush’s disastrous decision to invade Iraq, what many now consider the biggest mistake in U.S. history. Donald Trump and his minions now want to invade Iran, which would be an even worse mistake. Honest, accurate reporting would make clear why invading Iran would be a bad idea. We’re Americans. We’re supposed to be skeptical about our political leaders. We would not exist as a separate nation without a substantial willingness to doubt and resist political leaders. You helped Trump get into office. Now you need to report honestly and critically on him. He lies. Say he lies. Do not equivocate about his lying. He clearly knows nothing about the U.S. Constitution or the plan of government it details. He knows nothing about how to be president of the United States and he’s doing a really bad job of it. These are obvious facts that you should report as such. Will “conservatives” squeal about “liberal bias”? Of course they will. They are shameless. But any intelligent person can and should take a step back and evaluate their claims and refuse to allow interested whining to influence how you do your jobs. The nation needs good reporting. It’s time for reporters to step up.